Basically any consumable item you buy comes with a list of the ingredients and nutritional information on the package. The most notable exception might be beer, as well as wine and spirits. Sure, beer is frequently consumed out of a tap or in a bottle handed to you from a friend, but you won't even find nutritional details on the box the beer came in. That is about to change. 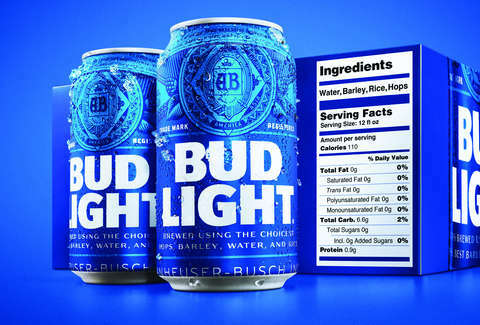 On January 11, Anheuser-Busch InBev announced Bud Light will be the first American beer with ingredients and nutritional information listed on the packaging. You won't find it on individual cans or bottles, but the new look will be seen on secondary packaging (the box the beer comes in). You will find the new look in stores starting at some point in February. Though, it's worth noting that they aren't the first to include ingredients. You won't find the full serving facts label, but some breweries, like North Carolina's Highland Brewing, already lists ingredients on some labels. Moreover, without any regulation of the label it's hard to know how accurate it is. You'll notice that yeast, a crucial ingredient, is absent from the ingredient list. "While ingredient labels are not required, consumers deserve to know more about their beer. We brew Bud Light with the finest ingredients and we’re happy to proudly display them on our packaging," said Andy Goeler, Bud Light's vice president of marketing, in a statement. "When people walk through a store, they are used to seeing ingredient labels on products in every aisle, except for the beer, wine, and spirits aisle. As the lead brand in the category, we believe increasing on-pack transparency will benefit the entire beer category and provide our consumers with the information they expect to see." Why is Bud Light listing ingredients on the label? The decision is shrewd on a couple fronts. Per the company's press release, the label says Bud Light contains 110 calories in every 12-ounce can. That information appears under the short list of ingredients, which simply reads, "water, barley, rice, hops." That last point matters because Anheuser Busch agreed to start adding serving facts and freshness code dating back in July 2016. At that time, the Beer Institute, a trade group that represents big breweries like MillerCoors, HeinekenUSA, Anheuser-Busch InBev, and Constellation Brands, agreed to voluntarily add serving facts and freshness codes to the beers of all the breweries in the organization by 2020. Despite the huge increase in the number of craft brewers in the U.S., the Beer Institute's breweries represent more than 80% of the beer sold in the U.S. Craft breweries have had their own packaging issues lately. The Bureau of Alcohol, Tobacco and Firearms (TTB), which approves labeling for beers, wines, and spirits, is closed due to the government shutdown. That has caused many headaches for craft brewers, some of which have had to delay new beer releases or have delayed plans to open new taprooms. However, a representative from Bud Light confirmed that this hasn't been an issue for the big brewer. Secondary packaging isn't subjected to the same approval process as cans and bottles. For now, it's something of a novelty you'll start to see at the liquor store in the coming weeks. But it won't be long before this is the standard, and you're going to have to face the reality that your favorite, dlicious craft beer is loaded with calories. Bud Light kept the campaign going by trolling competitors with its Super Bowl commercials on February 3. The brand went after Miller Lite and Coors Lite, accusing them of having corn syrup in their beer in a series of Super Bowl commercials. In fact, almost every spot Bud Light aired had that as the focus, with the exception of the unexpected Bud Light and Game of Thrones crossover commercial. Here's a look at one of the Bud Light ads talking about corn syrup, all of which took place in The Realm, the brand's world of "Dilly Dilly" commercials.